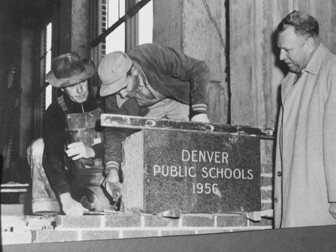 On December 3, 1952, a landmark meeting was held in Denver Public School’s Morey Junior High School auditorium that laid the foundation for what we now know as Rocky Mountain PBS. On this date, the “Committee on Educational TV” initiated a community discussion to consider the establishment of educational television in Denver. Representatives on the committee consisted of people from Denver Public Schools, University of Denver, Denver Public Library, Adult Education Council and University of Colorado. Following several smaller preliminary meetings, the committee widened its audience by inviting representatives from over seventy-five community and state organizations to attend the December 3rd meeting to publicly discuss the concept of creating Denver’s very first educational station. 3) a subcommittee on technical aspects and problems. These three committees concluded in-depth studies only a few weeks before the December 3rd public meeting. 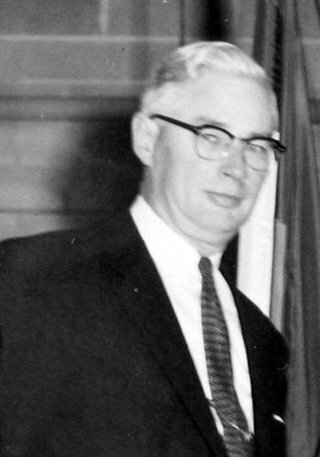 On November 25, 1952, Dr. Kenneth Oberholtzer, Superintendent of Denver Public Schools, sent an invitational letter to over seventy-five local organizations outlining the committee’s thoughts on educational television for Denver and inviting each organization to send representatives to the December3 meeting to further consider the idea. 2. The interest in educational television has been “so great and so widespread that last year educators throughout the country prevailed upon the Federal Communications Commission (FCC) to set aside 242 channels to be used for programs of noncommercial television. Would your organization be interested in presenting programs over an educational television station? What kind of community organization could be developed to promote and to administer this kind of program? Who would own the station? Who would operate the station? How would the construction and operation be financed? How much financing would be required? The meeting attendees were given an overview of the committee’s deliberations to establish public television in Denver. Along with the overview, a questionnaire was distributed on the merit of the idea, on the interest of telecasting and on the amount of financial aid needed for operation and expenses. This survey was completed by the meeting attendees and later tabulated revealing extremely positive results. Dr. Oberholtzer proposed that the Denver Public Schools be the licensee for Channel 6 (now Rocky Mountain PBS) and assume the responsibility for the capital costs of the station. His provisions included that there must be considerable community interest in the establishment of educational television and that there would be a sharing of the costs of operation. As a result of an overwhelmingly affirmative response at the December 3rd meeting, the original organizational group forged ahead and the Denver Public Schools made application for a studio construction permit from the FCC. The construction permit was granted by the FCC primarily due to the vast encouragement given on community interest and financial support. The committee selected the site for the studio to be on the corner of Thirteenth Street and Glenarm Place next to the Emily Griffith Opportunity School. 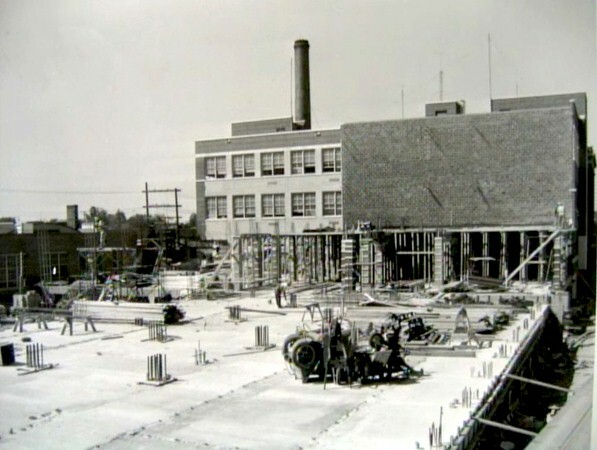 By March of 1953, blueprints were drafted for construction to begin on the new studios with plans to beam the signal from Lookout Mountain. As the 60th anniversary for Rocky Mountain PBS approaches (1-30-2016), the history of the station becomes all the more compelling. 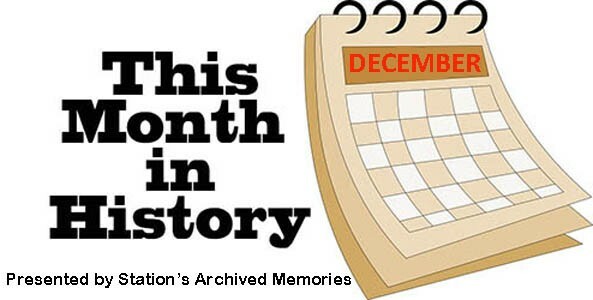 The archives contain a wealth of information of all six decades of our history. Please stop by the SAM Offices to explore the archives or contact SAM@rmpbs.org or 303-620-5734. 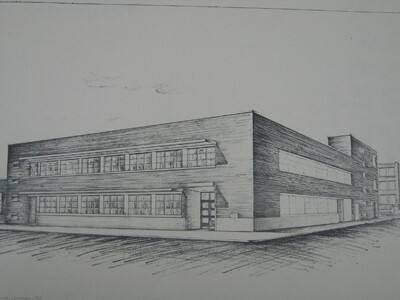 Architectural rendering of proposed KRMA studios at 1261 Glenarm Place, Denver. Placing the cornerstone brick into the studio building at 1261 Glenarm Place. We hope you've enjoyed this month's look back into the "History of Rocky Mountain PBS," made possible by the volunteers of Station's Archived Memories (SAM). Station’s Archived Memories (SAM) is a volunteer-driven project to preserve the history of Rocky Mountain PBS. If you would like to know more about the archives, please contact the SAM office at 303-620-5734 or email SAM@rmpbs.org.